"Phil Mickelson (left), not having Tiger there, will be the undisputed number one captain/player in the team room." Dates: 26-28 September. Coverage: Live commentary on BBC Radio 5 live, highlights on BBC Two and live text commentaries on the BBC Sport website each day via desktop, mobile, tablet and app. Europe vice-captain Padraig Harrington feels the USA will be galvanised by team spirit at this month's Ryder Cup. 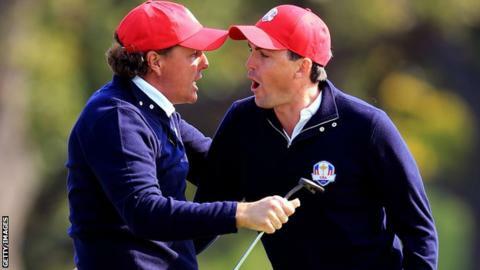 The US have lost the last two Ryder Cups and failed to gain four-and-a-half points needed to win from the 12 on the final day at Medinah two years ago. But Harrington said: "I'm worried the US are going to be better team-wise than they have ever been. "I'd be wary of them coming out with a point to prove and they are seemingly loving being the underdogs." The Americans will be without former world number one Tiger Woods, who ruled himself out of contention because of injury, but Harrington said: "Phil Mickelson, not having Tiger there, will be the undisputed number one captain/player in the team room. "The players like him and will listen to him. I think he will be a rallying cry for the US team." Joining Harrington on captain Paul McGinley's support staff for the big event at Gleneagles from 26-28 September will be former captains Sam Torrance and Jose Maria Olazabal, plus Des Smyth and Thomas Bjorn. "Nobody has put more effort in than Paul McGinley," Harrington said. "He has left no stone unturned. He feels he needs five guys to look after all the matches. "There are four groups on the golf course and he feels the four that aren't playing also need a vice-captain to support them." Keegan Bradley, Age: 28 Rank: 23 Ryder Cups: 1 (P4 W3 L1 H0) The 2011 US PGA champion formed a formidable partnership with Phil Mickelson at Medinah, winning three matches before losing to Rory McIlroy in the singles. Hunter Mahan, Age: 32 Rank: 20 Ryder Cups: 2 (P8 W3 L2 H3) The winner of the opening FedEx Cup play-off event in the US will make his third appearance. Lost the decisive match to Graeme McDowell in 2010, missed out in 2012. The European team boasts the current world number one, Rory McIlroy, who is in a rich vein of form having won the final two major titles of the season, plus the World Golf Championship event, the Bridgestone Invitational. Asked about McIlroy's role, Harrington, who won the final two majors of 2008, said: "I get the feeling that Paul wants Rory just to play golf, to lead on the golf course would be Rory's job. Lee Westwood's job would be to lead the team room. "We want Rory to win matches and win well - be undefeatable. That would be a big thing for our team if he goes out there and doesn't just win but doesn't give their guys a chance. A quick result can really give the rest of the team a boost." Regarding his own future ambitions, the 43-year-old Dubliner added: "I'd love to be a Ryder Cup captain in the future. "Managing 12 players is completely different than managing yourself, there are a lot of different emotions going on so I'm going to get a look behind the scenes to see whether I like it and am capable of doing it or if other people feel I can do the job."